Levaquin® also known as Ciprofloxacin and Levofloxacin are two antibiotics capable of causing severe, body-wide side effects, ranging from torn tendons and muscle pain to depression and psychosis. 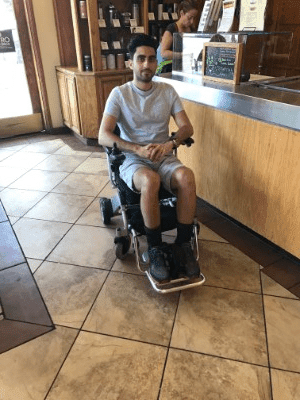 Dr. Mark Ghalili, DO, at Regenerative Medicine LA personally experienced Cipro toxicity, suffering numerous progressive symptoms including muscle wasting, neuropathy, and seizures so severe that he became fully disabled and wheelchair bound. Although he’s a board-certified internal medicine physician, he found complete healing in alternative and regenerative medicine, since traditional medicine had no answers. Now he’s dedicated to helping others achieve full recovery like himself. To schedule an appointment, call the office in West Hollywood, California, or book an appointment online. What problems develop due to Levaquin toxicity? Levaquin can cause serious damage to your central nervous system, potentially inflicting brain injuries and dysfunctions that affect your mental state. What should I know about Levaquin toxicity? Dr. Ghalili has performed countless hours of research into Levaquin toxicity (fluoroquinolone toxicity), studying how they affect your body and determining why they cause toxicity. Following a complex series of chemical reactions, these antibiotics result in an accumulation of free radicals that destroy mitochondrial DNA. The most important thing to remember about Levaquin (ciprofloxacin toxicity & levofloxacin toxicity) toxicity is that its effect is cumulative. Your first treatment may be successful and not cause any side effects. Then subsequent treatments can trigger the start of subtle symptoms as toxicity builds. The cellular changes produced by Levaquin toxicity disturb energy production for years. Their influence alters your genes, causing ongoing mutations and damage. The majority of fluoroquinolone victims are told they have chronic fatigue syndrome or fibromyalgia, which in my expert medical opinion is actually caused by mitochondrial toxicity secondary to fluoroquinolone antibiotic exposure. It is no coincidence that chronic fatigue syndrome and fibromyalgia is diagnosed in a 5:1 ratio of women compared to men. Many patients who come to Dr. Ghalili and were previously diagnosed with fibromyalgia and chronic fatigue syndrome have underlying cellular damage caused by Levaquin toxicity.